earthapplejane: Anzac Day Poppy Potato Prints! 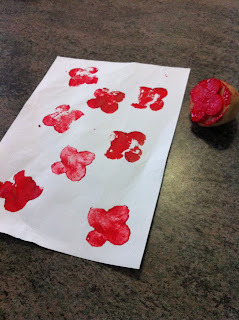 Anzac Day Poppy Potato Prints! Hello Everyone! Today, 25th April, is ANZAC day. ANZAC Day is probably Australia's most important national occasion. It marks the anniversary of the first major military action fought by Australian and New Zealand forces during the First World War. ANZAC stands for Australian and New Zealand Army Corps. If you would like to know more take a look at the Australian War Memorial website. So where, I hear you asking, do potatoes come in to this? Well, I have found a wonderful post by Jane from The Learning Curve blog. 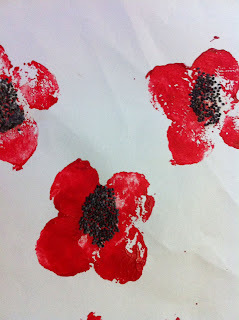 She is a primary school teacher,who is using potato printing with her young students, to depict poppies. "Poppies", as Jane says, "have been associated with Anzac Day since the 1920's. The red poppy reminds us of the sacrifice - the blood lost - in war. Poppies are also significant because these flowers grow naturally in the fields on the Western Front where many soldiers fought and died." I would like to finish this post on ANZAC day with some more thoughts from Primary School teacher Jane, who writes, " I hope that by commemorating Anzac Day, we will look back at the atrocities of war and search for better ways of solving our problems now and in the future". Thanks for sharing and thank you for your comment on my blog. Gorgeous prints. I have a soft spot for the Poppy with a little one named after this very flower. Kellie, Poppy is such a pretty name. I love the photo on your blog of your twin girls Poppy and Ava, in their little stripey tights. So cute! How do you make the potato print? Just cut the potato in half, cut a shape and dip into paint then print on the paper. Easy and fun!